Microsoft unveils Xbox One S Holiday Bundles starting at $199! If you are a console gamer, Microsoft has a lot to offer with Xbox One right now. Of course, those that can afford it should pick up the godly Xbox One X -- a true 4K gaming machine. Don't have $500 to spend on an Xbox? Don't worry -- the Xbox One S can play the exact same games -- albeit at 1080p. With that said, the "S" variant can play 4K Blu-ray movies, however -- all at a fraction of the cost of the Xbox One X. Today, Microsoft makes that price difference even more substantial. You see, for a mere $199, you can get an Xbox One S bundled with a free game! In other words, it costs less than half of an Xbox One X and comes with a game -- how can you beat that? "Xbox One S offers the best value in games and entertainment, with 500GB bundles starting at $199 for a limited time this holiday through the end of December 2017. Drive, explore, and race all over Australia with the Xbox One S Forza Horizon 3 Hot Wheels Bundle (500GB), featuring a full-game download of Forza Horizon 3 and the best-selling Hot Wheels expansion. 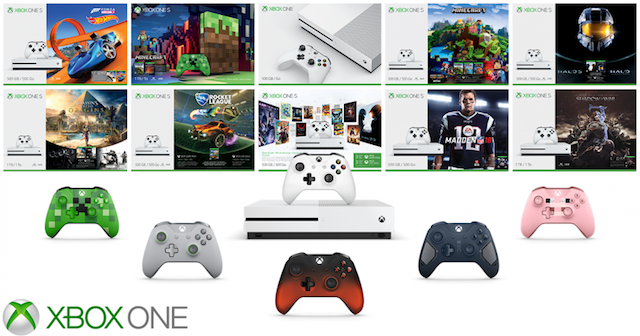 Or, create, explore and survive in your own Minecraft adventure with the Xbox One S Minecraft Complete Adventure Bundle (500GB)," says Microsoft. The Windows-maker also says, "If you're looking for more space, 1TB consoles are only $299! Discover the mysteries of Ancient Egypt with the Xbox One S Assassin’s Creed Origins Bonus Bundle (1TB), and unravel the origin of the Assassin's Brotherhood. Or free Middle-earth from Sauron with the Xbox One S Shadow of War bundle (1TB), and forge a new ring and siege epic fortresses." In addition to the console deals, Microsoft shares the following Xbox-related deals. Depending on your needs, both the 500GB and 1TB bundles are really great deals. If you don't want one for yourself, they would make amazing Christmas gifts for a friend or family member too. If you really want to wow someone this holiday season, look no further than Xbox One S.
Even if you aren't a gamer, remember, a good 4K Blu-ray player costs $100 and up. Think of it this way -- for $199 you are getting a 4K-Blu-ray player that just happens to play games too! Discs aside, Xbox One S can play all of your favorite streaming apps like Netflix and Hulu. To get the console and a game for less than $200 is an absolute steal. Seriously, this might be the best deal in home entertainment for the holidays. To make it even sweeter, if you spend $50 or more at the Microsoft Store, you will get a free limited-edition Xbox tree ornament too. Don't have $200 but still want an Xbox One? It's not too late to win one! Microsoft is giving away an Xbox One X Project Scorpio Edition here. Be sure to enter soon, as time is running out.